Or more accurately I’ve moved. After blogging at/for https://nothinginparticular.wordpress.com for nearly three and a half years, I decided to put up my own website, http://www.jackthescribbler.com. Besides containing all the previous site’s usual refinements, Jack The Scribbler will be more updated with uhm stuff that’s going on whatever or wherever that might be. Please pay me a visit at http://www.jackthescribbler.com. And yes, I plan to earn from this online venture — not that much but hopefully enough to pay for domain, hosting, and the occasional beer. In exchange, I will provide some form of entertainment. Content will be updated everyday for the next few days. In the meantime, why are you still here? Scoot on over to http://www.jackthescribbler.com. Credit must be given to Jayme Esmeralda Brucal-Gatbonton for helping me choose the platform for the new site. Thanks, Jayme. A chronology of recent tweets on my Twitter.com account. Currently addicted to Twittter — via JournoTwit — and my own alltop.com page. This has something to do with the fact that I have a deadline. On top of the fact that I like being challenged to say what I want to say in just exactly 160 characters. No more, no less. So there you go. Enough, Mr. Basilio, enough! You have ruined our weekend with your instant, useless, and incessant blather. Go beat a deadline or something. Next to feigning sickness and alien abduction, the death of a family member or a friend is one of the better excuses to avoid going to the office. This was exactly the reason why I was able to skip work for two days, however short and temporary. I told my supervisors that a friend died and I was in quiet mourning (i.e., comforting my similarly-bereaved friends while drinking vodka at the wake on the sly). In doing so, I accidentally stumbled upon one of life’s most well-kept secrets: to avoid work, have someone you know die. But that’s not as easy as it sounds. And in the case of Alecks Pabico, the very first Philippine Collegian editor I served, I would rather be a bundy clock boy and HR’s BFF than have him beat deadlines somewhere else. Alecks was so loved that hours after he died on Wednesday last week, funeral arrangements were already being prepared by an ad hoc committee composed of his friends — an ADB consultant, a UP law professor, a litigator, and myself, a drunkard. Although I fail to remember having to volunteer for such a responsibility, I took to the mission with much aplomb since it involved free alcoholic drinks upon its successful completion. Moreover, it was my only way of paying tribute to Alecks, one of the gentlest, funniest people I have known (and I say that as someone who excoriates the living, the dead, and other half-dead entities whose only contributions to this planet are hot air and carbon emissions). My task at Aleck’s wake, while easy, was both a curse and a privilege. It helped me get in touch with other friends I haven’t seen in decades but it also emphasized that the instant reunion was brought about by Alecks’ demise — an eventuality that he was prepared to face even before he knew his time was up. About a week before he died, he delivered a speech during a benefit concert held in his honor. Alecks pretended to stumble on the stage, much to the horror of the audience. He then chuckled, poking fun at the audience’s worst fears. During his remarks — which I missed by an hour — he also made light of his condition, just about the same attitude he exuded the last time he and I made contact. Sadly, it was only through Facebook (though we did see each other in August when Collegian alumni held a separate dinner in his honor). I was the first to reply and did so in jest. “What about your enemies? What will they do? :),” I said. Hours later, in the same status thread, he gave me a gentle reminder, something which I will never forget. Apparently, my online gesture wasn’t enough. Too bad we weren’t able to see each other one final time. In any case, I’ll always remember you, Alecks — inside and outside Facebook. Just promise to go easy on updating your status messsages. 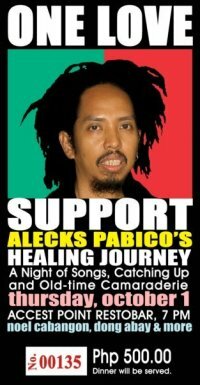 Contributions for the family of Alecks Pabico are still accepted at http://onelove.chipin.com. All funds will be allotted for his family, wife Mira, daughters Marlee and Kaya, and son Giles. Metro Manila residents are buying goods in bulk, depleting inventories of supermarkets, hours before a typhoon is expected to make landfall. Consumers have made a mad scramble for items such as sardines, biscuits, instant noodles, candles, batteries, and flashlights, the president of a Philippine supermarket association told GMANews.TV. “People are alarmed and they are buying more than what they need,” Steven T. Cua, president of the Philippine Amalgamated Supermarkets Association Inc., (Pagasa), said. The industry group is composed of supermarkets that serve the low to upper-middle market. “Selling areas are crowded and queues are very long,” he said on Friday evening as television news programs aired reports of empty grocery shelves. Demand for instant food items have surged since these can be prepared and consumed easily, Cua said. These food items can also be transported with minimal difficulty should consumers be forced to relocate and/or leave their homes in case of floods, he added. For the past few days, appetite for instant food items was driven by bulk-buying for relief operations for victims of the storm Ondoy. But on Friday night, consumers stocked up on their supplies, alarmed that a new storm may unleash effects similar to those wrought by ‘Ondoy’ just a week earlier. Meralco, Metro Manila’s lone electricity distributor, has denied the report. To ensure that inventories are well-stocked, supermarkets have switched brands, especially if quality, price, and sometimes even the manufacturer are the same, Cua said. He also acknowledged that inventories have been reduced as some deliveries were delayed by floods that were caused by record amounts of rainfall a week ago. But buffer stocks of basic goods remain stable, Cua said. This view is shared by Corazon C. Curay, logistics director at the Makati-based XVC Logistics Inc. Curay is also the president of the Supply Chain Management Association of the Philippines (SCMAP), an industry group that represents firms that store and deliver goods made by manufacturing giants such as San Miguel, Nestle, and Johnson & Johnson. Damage to inventories has been minimal, Curay told GMANews.TV in an earlier phone interview held four days after Ondoy submerged the Philippine capital. “Manufacturers just have to catch up on production,” she said, adding that some companies may be forced to sell their products in larger or smaller sizes, depending on their stocks. Although Curay expects an increase in bulk prices of raw materials, companies will refrain from passing on the hike to its customers since it may translate to lower market share. She also downplayed apprehensions that delayed deliveries and increased demand will boost basic goods’ prices. Despite reports of increased bulk-buying – which raises the possibility of higher goods prices – neighborhood groceries have yet to buy double of what they usually purchase, Cua said. This indicates that they do not expect higher prices in the short term, Cua explained. “If they wanted to take advantage of higher prices in the future, smaller stores would have bought more,” Cua said. New blog entry can be found by either visiting GMANews.TV’s blog section or my new lite blog, yabbb.tumblr.com. Thanks for stopping by. May migrate to a simpler blog platform but before I make that decision, I need to write slash blog more. Onward and upward! Elizabeth Tundag (left) and Pricella Gealon try to cheer up despite their exhaustion during the last day of Cory Aquino's wake. On Tuesday morning of August 4, Pricella O. Gealon and Elizabeth S. Tundag were able to book reservations and fly to Manila on the same day. By 8:30 in the evening, the pair was already bound for the Philippine capital, somewhat pleased with themselves after getting good prices for their tickets. But they weren’t exactly in the mood to relish their good luck. View from one of Rome's public squares taken in 2007. ———————————————————— *Also known as Flickr Kuno, a text-based widget featuring the caption of the picture on the header above. The picture will be replaced on a regular basis, depending on the website operator's mood, inclination, and the position of the Moon in relation to Mars. My Twitter Account Don’t follow me — I’m lost too. 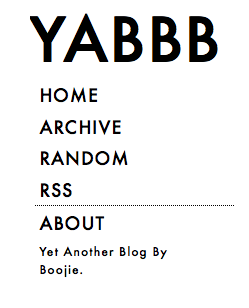 Yet Another Blog by Boojie What did I just say?